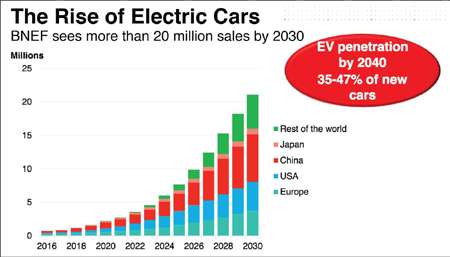 " By 2020 there will be over 120 different models of EV across the spectrum, "
Speaking this week at the Bloomberg New Energy Finance conference in New York, Total SA's chief energy economist, Joel Couse, forecasted that EVs will make up 15 to 30 percent of global new vehicle sales by 2030. Oil demand for transportation fuel see its " demand will flatten out ," after 2030, Couse said. " Maybe even decline. " Colin McKerracher, head of advanced transport analysis at Bloomberg New Energy Finance, sees Couse's forecast as the highest EV sales margin yet to be forecasted by a major company in the oil sector.
" That's big, " McKerracher said. " That's by far the most aggressive we've seen by any of the majors. " Shell and Total SA have been looking to diversify their energy assets through hydrogen as a transport fuel. In January, both companies joined a global hydrogen council that included Toyota, Liquide SA, and Linde AG. The companies will be investing about $10.7 billion in hydrogen products over the next five years. Like hydrogen fuel cell vehicles, electric vehicles have major walls to climb to find mass adoption in vehicle sales and infrastructure. One barrier is the cost of owning an electric vehicle versus a cheaper, comparable gasoline-engine vehicle. The battery pack in an EV can be quite expensive, making up half the cost of the car, according to BNEF. Backers of EVs point to two trends fast approaching the market; with one being the longer range, 200-plus-miles per charge EVs coming to market like the Chevy Bolt and Tesla Model 3. The higher-priced versions of the Tesla Model S and Model X are thought to be a sign of it, with consumers willing to finance or lease one of these EVs to gain access to more power and longer range. Automaker are feeling pressed by strict emissions reduction rules in Europe and China, with other markets like the U.S., Japan, and South Korea having similar standards. Auto Shanghai has been a showcase for existing and startup automakers launching several EVs to the China market, with some of them ending up overseas. It's helping that lithium ion battery prices are dropping about 20 percent year, as automakers spend billions on electrifying their vehicle lineups. Volkswagen wants to see at least 25 percent of its vehicles sold in 2025 to be EVs. Toyota is moving toward selling zero fossil-fuel powered vehicles by 2050. Another sign that the Total SA report carries some weight is the diverse and broad portfolio of EVs that automakers till be rolling out on the market soon.
" By 2020 there will be over 120 different models of EV across the spectrum, " said Michael Liebreich, founder of Bloomberg New Energy Finance. "These are great cars. They will make the internal combustion equivalent look old fashioned." Electric cars only make up about 1 percent of global vehicle sales, so making it to 30 percent in the short-term future would be a huge leap. Analysts point to a few market forces that need to be addressed before that technology takes off in sales. Among those issues are pre-incentive prices coming down, distance per charge going up beyond 300 miles, and the fast charging infrastructure becoming pervasive and cost competitive to gas pumps. Jon LeSage is a California-based journalist covering clean vehicles, alternative energy, and economic and regulatory trends shaping the automotive, transportation, and mobility sectors. Petroleumworld does not necessarily share these views. Editor's Note: This commentary was originally published by Oilprice.com, 05/02/2017. Petroleumworld reprint this article in association with Oil Price.com. Link to original article.